I was going to post about this. The article confuses me...but that may be because of the translation? There's a mention of a stela that mentions Khufu restoring the sphinx-but wasn't it carved during Khafre's reign (according to conventional Egyptological theories, at least)? That makes me a little wary of the credentials of the rest of the article. I have never heard of the sphinx being hit by lightning before. I've seen a lot of things about the sphinx having too much water erosion, but not lightning. I've never heard of Egyptian texts mentioning the sphinx being struck (certainly not in the dream stela), nor have I seen any mention of any physical evidence of lightning on the sphinx. I'm sure I remember seeing somewhere, a long time ago, that there's a text that mentions something in Giza being hit by lighting during an Old kingdom king's reign, but I'm not sure if I'm imagining things or that there is such a thing out there-does anyone know of such a text? The only storm-related texts I can think of that do exist are the ones reporting freak rainstorms...but those are from a much later date. I also have never heard of the sphinx wearing a metal crown before-where did that idea come from? I know pyramids had gold capstones but I've not heard of the sphinx as wearing a crown before. This is not a new theory. At least it's based on Egyptian philosophy (the importance of duality) but I'm harldy the only one who doesn't buy into it. El Shammaa appears to be taking the idea of duality to extremes and is basing too much of his theory on absolutism--which is always a bad road to take, even with the regimented ancient Egyptians. Note that neither El Shammaa nor anyone else can provide even a tiny speck of physical evidence, which makes the theory suspect from the get-go. You can also click here for a nice Tour Egypt photo I came across. The only place I can picture a second Sphinx is the area I've marked as "Mastaba Field" in the above Google Earth image (south of the Great Sphinx), yet no evidence of anything that colossal has ever been found there. Bear in mind that probably more so than anywhere in Egypt, the entire Giza Plateau has been exhaustively poked, prodded, and excavated--any evidence of a second colossal Sphinx would've been found ages ago. Nothing of any importance appears ever to have been situated to the north of the Sphinx; that's the only other place such an edifice would've been prepared. It would not have made any sense whatsoever to have built one behind the existing Sphinx, and we know nothing could've been before the two temples on the east side of the Great Sphinx because that used to be the quay--the body of water used to transport granite stones to the building site and, later, the approach used by officials arriving for the celebration of the cult of the king. The article quoting El Shammaa mentions the inventory stela. Isisinacrisis pondered in her post that it wasn't carved in Khufu's time, and she was correct. In fact, it wasn't carved anywhere near in time to the Old Kingdom--it was carved in Dynasty 26, the Late Period, over 1,800 years after the time of Khafre, the king to whom the Great Sphinx is traditionally attributed. The inventory stela cannot be taken as legitimate evidence of anything occurring almost 2,000 years before it was erected. El Shammaa believes that the temples raised near the sphinxes came after the Giza Pyramids were built, which is further proof of the sacred status of these statues. 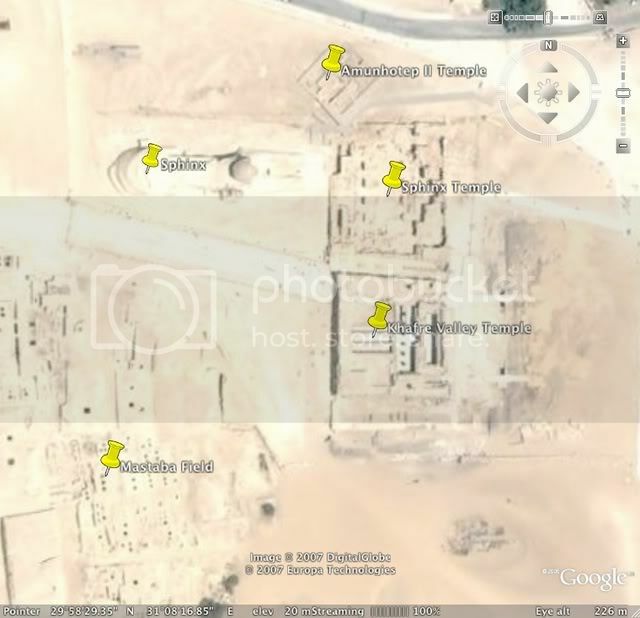 So El Shammaa alleges that neither the Valley Temple of Khafre nor the Sphinx Temple (see the Google Earth image above) existed at the time of the Great Sphinx, and yet analysis of the stones of the Sphinx Temple has confirmed that they were quarried from around the body of the Great Sphinx. It's not like the ancient Egyptians decided to carve a sphinx on the barren plateau. The bulk of the Great Sphinx began as a limestone massif or natural protuberance at the east edge of the Giza Plateau, and quarrying operations for the Great Pyramid of Khufu exposed more of it. It might be logically argued to this day whether Khufu or his son Khafre commissioned the Sphinx, but no respected scholar believes it had stood there in sphinx-form for thousands of years prior to the erection of the three Giza pyramids. Lastly, I would be suspect about just how much truth there is to the title of "Egyptologist" ascribed to El Shammaa. He touts himself as such on his webpage, but that doesn't necessarily mean much. I have no reason to doubt that he studied pharaonic Egypt while he was in college in Alexandria, but an Egyptologist that does not make. He seems to have published very little, in fact (a big red flag there). Take what he says with caution! Larry Orcutt has a page devoted to the idea of a second Sphinx. In his page, he quotes medieval Arab scholars who thought there was a second sphinx, and mentions that a possible location for it is now under water as the Nile has changed course. This probably only adds to the confusion and disinformation out there, but the page is nicely, logically laid out and worth a look at any rate. since lions(in egypt)characteristically lived on the desert margins,they came to be cosidered as the gaurdians of the eastern and western horizons,the places of sun rise and sun set.in this connection,they sometimes replaced the eastern and western mountains,symbolic of past and future,on either sign of the horizon hieroglyph(akhet)..since the sun itself could be represented as a lion,chapter 62 of the book of the dead states:may i be granted power over the waters..for i am he who crosses the sky,i am the lion of ra. the sphinx isn't a lion with a man's head, it isn't a lion at all, everybody who is well known about animals can tell in an instant that this statue is about a dog not a lion. Lions have pelvises which stick out above their backs if lying down also lions have a tail like a paintbrush. Personaly I think it was a statue of Anubis and they recarved the head later. That's really interesting! I didn't know that. The Great Sphinx at Giza is pretty badly worn away in places, though, so is it possible that the pelvis of the Great Sphinx was originally depicted in that way?? I don't know why, but Sphinxes just seem to appear more lion-like to me, but that could be because that's what I've always known them to be. This may have more to do with the constraints of the limestone massif with which the Egyptians had to work when carving the Sphinx. The limestone matrix on the Giza Plateau constains strata of rather weak and friable stone, something the craftsmen would've known and taken into account. They most likely would never have attempted a wide and flairing pelvis because the folded knees and legs of the Sphinx would've been guaranteed to break off. Here the bodies are clearly those of lions, even if they don't exactly match the pelvises and hind legs of the animal in Aktisanes's photo. There is no precedent of which I'm aware of a sculpture of a king-headed jackal, and I've never heard of evidence suggesting the Sphinx was originally a jackal or other canid. What I think we have here is a close approximation of a lion's body limited by the quality and shape of the stone massif which the craftsmen had available to them. hmm... tried to add a picture of where I think the second sphinx is. Got this message: "Usage of forbidden word"
Clicked on user groups and no user groups exist. So it appears there is a mound of sand covering a big rock in a symmetrical position to the existing sphinx. And the size of this rock is identical in size and shape to the current sphinx. The Sphinx of Giza is a symbol that has represented the essence of Egypt for thousands of years. Even with all of the pictures that we see of the Sphinx, nothing can really prepare you for the time that you finally see the Sphinx with your own eyes. Here's a look at the Sphinx that will give you a hint of what you can expect to see if you visit Egypt. Just be careful of Starbucks and Maccy D Signs when taking photos. Nothing like ruining a perfectly good photo of Ancient Egypt those. Photographs sadly do not replicate what we see and feel when actually in Egypt. It is an honor and privilege to be there, but photographs are the next best thing.